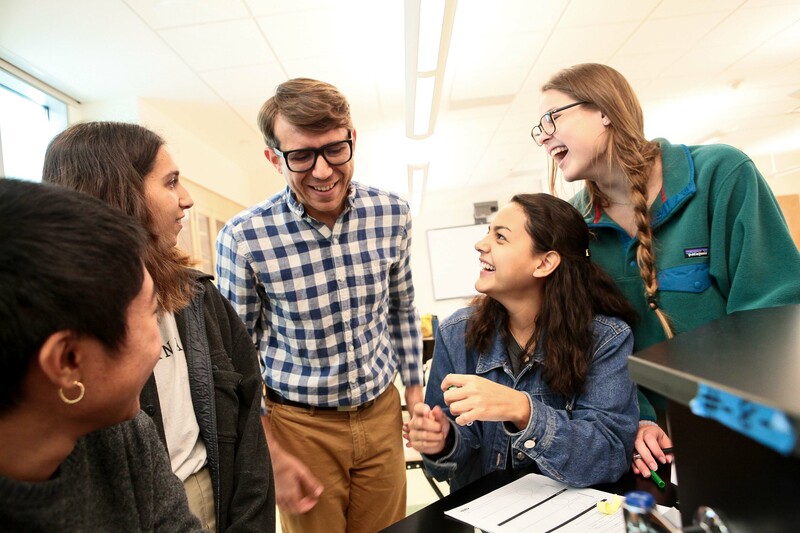 The Upper School science program at Westridge is more than classroom research; it's hands-on, experiential, and interdisciplinary. Find out how Ryan Skophammer, Ph.D. teaches girls that science concepts have a direct impact on human civilization in this interview. What inspired you to teach at Westridge? My experience as a teacher had always been that women were the best and most engaged of all of my students. I had a longstanding affinity towards teaching the best, so coming to Westridge knowing I was only going to teach girls was a very attractive prospect for me. When I was looking for a job, I was looking for an environment where I could challenge my students. I felt that I could really do that at a girl’s school and that the students would be willing to meet my challenges. All the students here are very engaged, they give you their best, and their work is really high quality. What is the Research in Science Program and why do you think it’s important? The Research in Science Program is a full-credit class for seniors where they spend 6-8 hours a week off campus in a professional lab setting, either at a university or hospital. It is an opportunity for the students to get into the lab, to talk to people who have chosen a career in research, and to gain an understanding of what their day-to-day activities are like. Our students have had some really amazing experiences through this program. Like last year we had a student who was working with Dianne Newman, who won the 2016 MacArthur Fellowship. Our student was working with her on how certain opportunistic pathogens respond to anoxic environments, for example, modeling what happens when a cystic fibrosis patient gets an opportunistic infection in their lungs. Last year we also had a student working in a social science lab for the first time. She worked with a quantitative economist at Caltech on a study about bargaining. She got to ask a question and design a research study by herself to look at the choices people make when they’re bargaining on behalf of another person as opposed to bargaining for themselves. Then, her mentor administered her study to students at UC Irvine and they analyzed the data together. Her project might end up as a paper or a grant in the future. This program is also a great supplement to classroom instruction because it forces the students to think about problems the way that a researcher would, not the way that a science student would. That’s my goal for our classroom—that it teaches them how to think about science problems, not just remember science facts. What is unique about the science program at Westridge? We take a lot of field trips. I’ve taken the AP Environmental Science and Biology classes to Catalina to work with scientists from USC Wrigley Marine Institute, where we check on use of a marine protected area. This way they get to see what real scientists are doing out there in the field. I’ve also taken my AP Biology students to Chantry Flat in the Angeles National Forest to collect macroinvertebrates from a stream. We then bring our specimens back to the classroom, sort and classify them, and analyze them to see if the environment is driving a difference in community composition. Last year I had four students from the Research in Science program present at the Southern California Conference of Undergraduate Research and we took about 15 other students to see them present. As far as I know, they were the only high school students presenting at the conference. It’s a great experience for them and it exposes them to a professional activity that they’ll have to undertake if they decide to become researchers. What are you excited about this year? Is there anything new going on in your class right now? This year I’ve turned my AP Biology class into a research lab to evolve yeast strains that can survive in the presence of an over-the-counter nail fungus killer. I trained with a professor at the University of Washington over the summer who I felt was the leader in experimental evolution in yeast and we developed this project together. This project will allow me to teach all the important biological concepts in the curriculum as they apply to the yeast. Every day the students come to class and the first thing that they do is transfer their yeast from the old test tube to the new test tube with fresh yeast food. Right now, the yeast seems to be growing pretty happily, even in the presence of this anti-fungal. We’re now at the stage where there are lots of choices for the students to make about when and how much more to crank up the dosage. Some groups are trying to make mutant yeast to resist the anti-fungal by using a mutagenic UV lamp being lent to us by a Research student’s mentor at Caltech. In a few months when the yeast is evolved, we’ll send the yeast strains back to Seattle to have their genomes sequenced. The students will then look for genetic changes and try to link those to protein changes or regulatory changes in the organism. I want what they learn in this class to be part of their overall skill-building process as a student, I don’t want to just teach them facts that they’ll leave behind. As a teacher I’m always trying to find ways to get at that and I’m very excited about this project’s potential to do that. What interdisciplinary programs have you worked on at Westridge? One program I’ve worked with is the Perspectives in Literature class. Last year the theme for the class was “monsters.” The English teacher chose the texts and then I found ways to teach science that would help them contextualize the literature. Sometimes I took the theme very literally, studying the evolutionary development and biology behind monsters by reading a paper about flies that had legs coming out of their heads. For other assignments, I took a different approach. When they were studying The Metamorphosis, we talked about the disposability of an individual to society. I had them read a paper and discuss the concept of human sacrifice and how it has helped maintain the social order throughout the history of human civilization. It’s all about using the tools of science to understand a concept and how that concept has affected history. Ryan joined Westridge in 2013, following two years as a visiting assistant professor at Whittier College, where he taught college writing and lower and upper division biology classes. Prior to that, he was a postdoctoral researcher and visiting scholar at University of California, Riverside. He holds a B.A. from Pomona College and Ph.D. from the University of California, Los Angeles. In addition to teaching at Westridge, Ryan is assistant coach to the JV soccer and track and field teams.